To Cite: Chen L, Yang B, Chen K, Tsai Y. 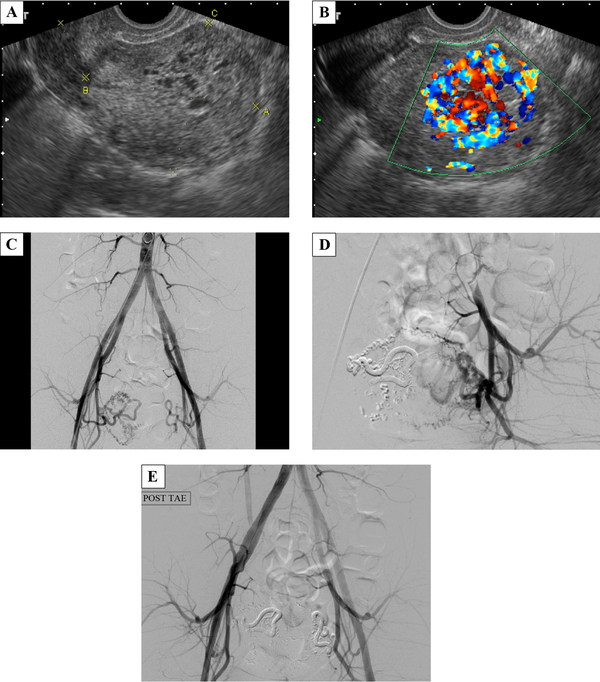 Successful Transarterial Embolization of Uterine Arteriovenous Malformation: Report of Three Cases, Iran J Radiol. 2016 ; 13(1):e15358. doi: 10.5812/iranjradiol.15358. Figure 1. A 25-year-old female with a history of dysmenorrhea and irregular duration and intervals of menstrual cycles who came to the emergency department with acute abdominal pain and heavy vaginal bleeding with blood clots. A, Transvaginal gray-scale ultrasonography of the uterus revealed multiple varying-sized hypo-echoic lesions. B, At the same plane, the color Doppler ultrasonography showed a hypervascular lesion with multidirectional turbulent flow (typical mosaic pattern), measuring 4.9 × 3.3 × 2.6 cm in size in the endometrium and myometrium of the uterine fundus. C, During angiography, the catheter was inserted from the right femoral artery and its tip was at the end of the abdominal aorta. Aortography showed the feeding artery from the branches of the right internal iliac artery and tortuous veins with rapid venous shunting. D, After right-uterine-artery embolization, there were still some collateral abnormal vessels formed on the left side. E, Finally, bilateral superselective embolization of the uterine arteries was done smoothly. Figure 2. A 38-year-old female with hypermenorrhea and intermittent severe abdominal pain for 12 days. A, Transvaginal gray-scale ultrasonography of the uterus shows hypo-echoic cyst-like lesions. 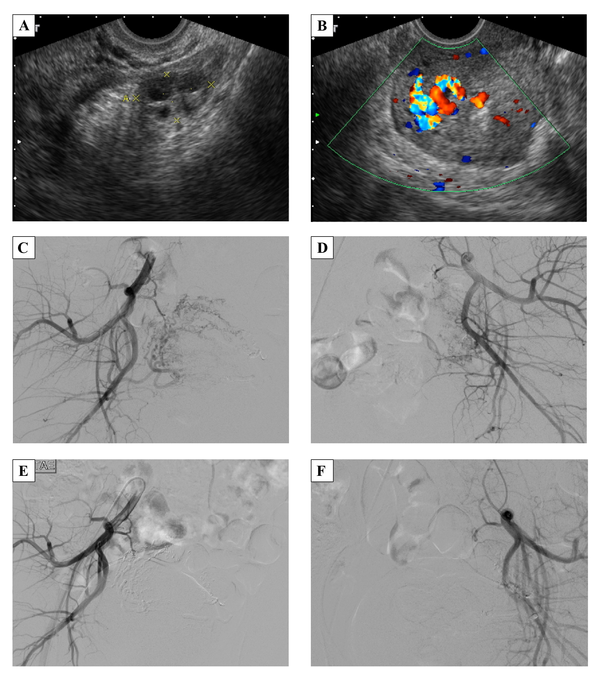 B, The color Doppler ultrasonography demonstrates a hypervascular lesion, 2.7 × 2.4 × 2.1 cm with multidirectional turbulent flow at the body of the uterus. The main lesion is in the myometrium. C, Spectral Doppler ultrasonography shows low resistance index of 0.4. D, Angiography shows vascular tangles from the branches of the bilateral internal iliac arteries. E, Bilateral superselective embolization of the uterine arteries was done smoothly. F, The follow-up color Doppler ultrasonography shows a smaller lesion, 2.0 × 1.3 cm with minimal vascularity. Figure 3. A 22-year-old female with prolonged menstrual bleeding for 2 weeks and sudden heavy vaginal bleeding. 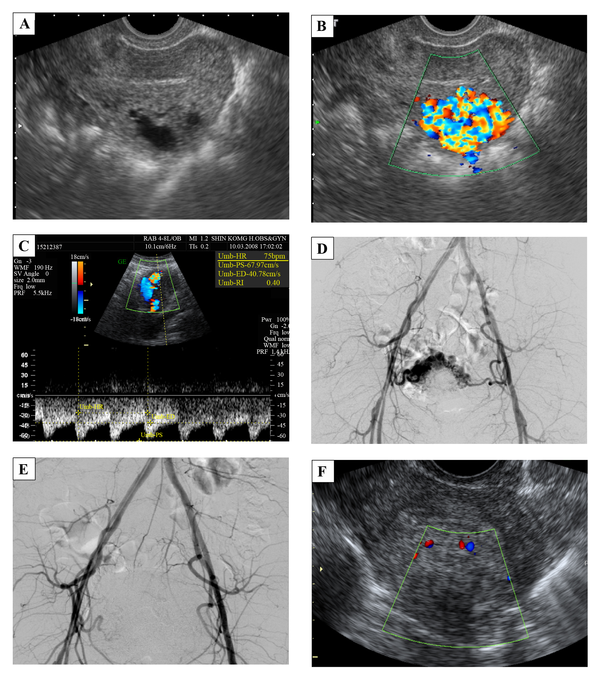 A, Gray-scale ultrasonography reveals multiple hypo-echoic myometrial lesions. B, Color Doppler ultrasonography shows a hypervascular lesion, 3.0 × 2.7 × 1.7 cm in the endometrium and myometrium of the uterine fundus. C and D, Angiography of the right and left uterine arteries demonstrates multiple abnormal vessels from the bilateral uterine arteries, particularly from the right side, and rapid venous shunting. E and F, After treatment, angiography shows total occlusion of AVM.